Looking for something fun to do this weekend? This weekend marks the 9th Annual Carolan Festival, a gathering for people who play, listen, sing or dance to the music of Turlough Carolan, a blind Irish harper and composer. The Irish festival takes place in a beautiful Vermont country setting overlooking the North Branch of the Winooski River and Worcester Range. The weekend will be filled with Open sessions, Workshops, Country & Ceili dancing, music & dance (English Country, Irish Ceili & Step, Morris& Rapper, sean nos, waltzing) performances & concert. Rain or Shine. This is the only festival devoted to the music of Carolan in the USA- there are 2 O’Carolan Festivals in Ireland. 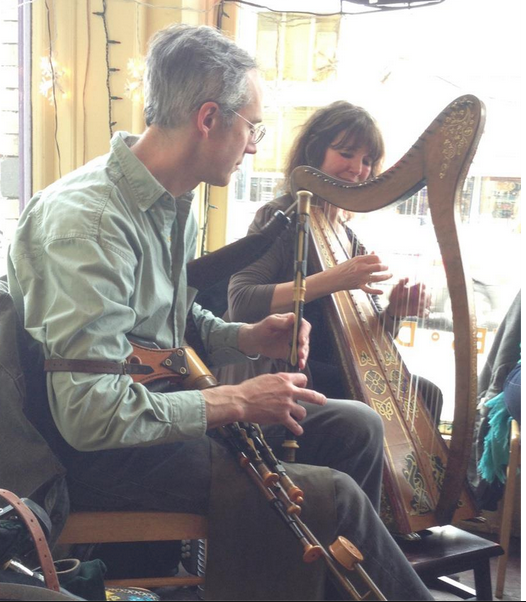 Wonderful harpers will be performing (including Hilari Farrington), but many other instruments will also be played. The music lends itself to a wide spectrum of music, dance, and song. Please visit the website www.carolanfestvt.com for more info.